The plenary hall at U.N. headquarters in Bonn, Germany, where diplomats are meeting this week to discuss the future of the Paris Agreement. Photo courtesy of the United Nations Framework Convention on Climate Change. A skeleton crew will represent the United States at U.N. climate talks that begin today in Bonn, Germany. The seven U.S. civil servants who will participate in the two-week session are short on marching orders as well as personnel. Two years ago, the United States sent 45 people to the same type of midyear negotiating session. About 97 people traveled as part of the official U.S. delegation to the 2015 Paris summit, where they helped deliver a global accord. This week, the tiny team will have the unenviable task of explaining President Trump's climate change policies to an anxious world. "They will be expected to explain the administration's policy, which rules will be retained and which rescinded, the impact of these changes on the U.S. target, whether any international finance will be forthcoming, and, of course, whether the U.S. will remain in the Paris Agreement," said Christo Artusio, a former director of the State Department's Office of Global Change. He said his former colleagues "will be in a rough position." The White House has promised a decision on whether or not the United States will remain a party to the Paris Agreement by the time Trump travels to Sicily late this month for the Group of Seven leaders' summit. But top administration officials are expected to hold their third major internal debate on the issue tomorrow, and there's a chance a ruling could come as early as this week. The G-7 group of major economies is powerfully in favor of the Paris Agreement. It's likely that the Trump team will warn its G-7 partners of its decision during a "sherpa" meeting on May 15 and 16 rather than unveiling it in Sicily, where it would eclipse other issues on the group's agenda. Should Trump decide to "cancel" the Paris deal as he promised in the campaign, and should that news leak out while thousands of diplomats and activists who have dedicated their lives to fighting climate change are meeting in Bonn, environmentalists are ready with their spin. A withdrawal, they insist, will do more harm to the United States than to the Paris Agreement. "If the U.S. decides to leave the agreement, this will be unwelcome, I think, by everybody," said Paula Caballero, global director of the World Resources Institute climate program. But Caballero said climate leadership has become "diffuse and decisive" in recent years, and now no longer depends on a proactive United States wrangling recalcitrant international partners. The meeting in Bonn seeks to make progress on the Paris Agreement's rulebook, including ensuring that countries are transparent as they implement their emissions targets. Technical experts will meet, and 27 other countries will join the United States in having progress toward their pre-2020 emissions reduction targets scrutinized in an open forum. 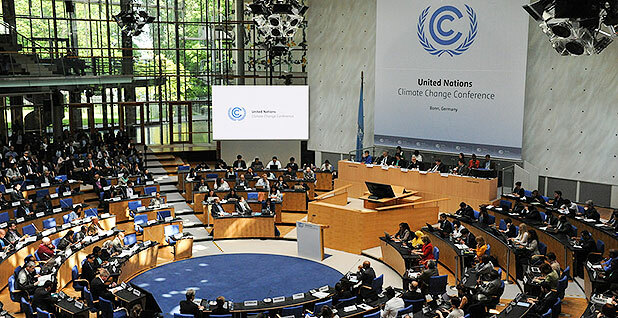 "Despite the political unknowns around the climate talks, in Bonn, negotiators have real opportunity to advance implementation of the Paris Agreement," added Yamide Dagnet of WRI. Of course, none of this will be the news out of Bonn if Trump announces a Paris exit in the middle of the talks. "It's like rearranging deck chairs on the Titanic," one source predicted. The U.S. team will be led by Deputy Special Envoy for Climate Change Trigg Talley and includes six State Department officials. The State Department roster includes Andrew Rakestraw, from the Office of Global Change, a co-facilitator on negotiations on the transparency provisions; Kimberly Carnahan; Jennifer Austin; Andrew Neustaetter; and Meredith Ryder-Rude. The team is small even by off-year standards. The United Kingdom's government, for example, is sending 26 participants to the meeting. It is unclear whether the Trump administration approved so few civil servants because it is hostile to the Paris Agreement and the underlying framework or because it is paring down its commitment to multilateral processes more generally. Correction: An earlier version of this story incorrectly reported that a representative from the White House Council on Environmental Quality would attend the meeting. No one from the White House will be there.